Jan 11, 2008: The first game of the season was a barnburner in Toronto featuring 33 goals and 37 penalties totalling 162 minutes. It was also quite an eventful night all around. There were three fights: Cam Woods vs Sean Pollock, Ryan Benesch vs. Ryan Sharp, and Woods again vs. Travis Hill. Benesch, that goon we all know and love, managed to get a whole whack of penalties: 2 for checking from behind, 5 for fighting, 5 for roughing, two 10 minute misconducts all at the end of the 2nd, and then another 2 for unsportsmanlike conduct near the end of the 4th. And he scored 3 goals. Just to be clear, Benesch was playing for the Rock in 2008; he didn’t join the Swarm until 2010. And his fighting partner, future Rock player Sharp, was playing for the Swarm. The game itself was very close – it was tied at 3, 4, 5, 6, 7, 8, 9, 13, 14, and 16. The Swarm won the game 17-16 on an OT winner by Ryan Cousins. This was also the night where Rock head coach Glenn Clark got involved in an altercation with the Swarm’s Sean Pollock outside the Rock dressing room after the game. Clark was charged by Toronto Police and suspended by the NLL, though both the charges and the suspension were dropped about a month later. Jan 12, 2008: The next night, the Rock and Swarm played again in Minnesota. The Swarm won this one as well, 11-4. The same Nick Patterson who allowed 16 goals the previous night kept the Rock to only four in the rematch. There were no fights in this one, or at least no fighting penalties, but nine unsportsmanlike conduct penalties (5 minors, 4 misconducts) were handed out at the end of the game. Starting in net for the Rock: Mike Poulin. Jan 26, 2008: Another high-scoring OT game, and one of the ones referred to in the first tweet linked above. The Swarm led the Knighthawks 12-5 at halftime but the ‘Hawks came roaring back, outscoring the Swarm 9-3 in the third, including two on the power play and three shorthanded goals. Rochester tied it at 16 midway through the fourth and then took a brief lead, but Sean Pollock scored a minute later to tie it once again, and then Pollock scored again 6½ minutes into OT, his first of five game-winners on the season. Not bad for a team that won ten games. Feb 2, 2008: Colin Doyle picked up 11 points and Jeff Zywicki 9 but the Swarm still defeated the San Jose Stealth 14-12. Feb 8, 2008: The Swarm held the New York Titans scoreless until 6:16 into the 3rd quarter. Minnesota had a 12-0 lead at that point and went on to win 16-9. 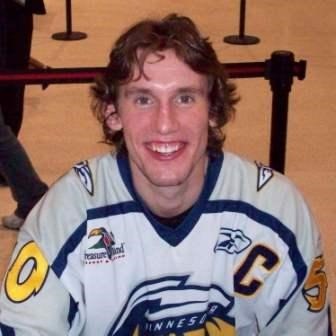 Feb 10, 2008: Ryan Cousins scored his second OT winner in a month (the only two of his career) in a 14-13 win over the LumberJax. Feb 16, 2008: After a 6-0 start, the Swarm finally lost one, 16-14 to the Bandits. Another close game as Sean Pollock, once again, tied it up late but the Bandits came through with a couple in the last few minutes to take it. Ryan Sharp took the last four penalties of the game: two for tripping, a minor and a misconduct for unsportsmanlike conduct, and then another ten for obscene language. You don’t see that last one called all that often. Feb 22, 2008: The other game from the tweet above. Minnesota was winning 7-6 after three, then Philly outscored them 11-1 in the 4th to win 17-8. Six goals for Athan Iannucci, four of which came in the fourth quarter. Mar 8, 2008: Another loss to Buffalo, this time 11-7. This one was low-scoring and close, tied at 5 in the 3rd, until Buffalo scored five straight and the Swarm couldn’t get back in it. Mar 14, 2008: Back in the win column against the Chicago Shamrox, and another solid first half. The Swarm led 7-0 in the second and 8-2 at halftime. Chicago got back within three in the fourth but that was as close as they got as the Swarm took it 13-9. Mar 29, 2008: After a bye week, a rematch against the Shamrox. The Swarm were winning 5-1 after one, then Chicago scored 10 straight to take an 11-5 lead and eventually won 15-10. Future Swarm star Callum Crawford scored two for the Shamrox. Apr 5, 2008: A close one against the Titans, tied halfway through the fourth. Sean Pollock, who’d already given the Swarm a brief lead in the 4th, scored the game winner and an insurance goal 30 second later as the Swarm took this one 12-9. Apr 12, 2008: Another OT win, this one 15-14 over Philadelphia. Minnesota scored 9 in a row in the 1st and 2nd and took a 10-3 lead into halftime. But Philly went on a 11-3 run to take a 14-13 lead, then the Swarm’s Dan Marohl (traded from the Wings earlier in the season) scored at 14:58 to force OT. The OT winner? Of course, it was Sean Pollock. Ryan Sharp got his second obscene language misconduct of the season. Guess how many of those were handed out in the NLL in 2008? Yup, two. Apr 19, 2008: An 11-8 loss to the Knighthawks. This was a very close game– every goal until five minutes into the third quarter either tied the game or broke a tie. The Swarm only scored twice in the second half and still only lost by three, and one of those was an empty-netter. Apr 25, 2008: After the Swarm took a 4-0 lead and kept the Shamrox off the board for almost twelve minutes, Chicago scored seven straight and shut out the Swarm for almost 25 minutes. The second half was much more even and Minnesota got back within one twice but couldn’t tie it up and lost 12-10. Apr 26, 2008: Another close game against those division-rival Shamrox to finish off the season. Once again, the Swarm only scored twice in the second half (and not at all in the fourth quarter) but managed to hang on for a 12-11 win. Sean Pollock scored the game-winner yet again. In case you’re wondering, Pollock was the Swarm leader in the Money Ballers competition in 2008 and ended finishing fourth overall. Athan Iannucci was the runaway winner that year. May 3, 2008: The New York Titans came to town to play for the right to face the Bandits (who had beaten the Wings the night before) for the Eastern Division title. Just like many of their regular season games, this one went down to the wire until the last few minutes. The game was tied at 1, 2, 3, 4, and 5 in the first half, and then 7 and 8 in the fourth quarter (last goal that tied the game: Sean Pollock) before the Titans scored three in the last five minutes to take the game and eliminate the Swarm. The Titans would go on to lose to the Bandits, who would beat the Portland LumberJax in the Championship game. The Swarm had five players with 50+ points. Andy Secore led the way with 76 in his only season with the Swarm. He would go on to play three seasons in Edmonton. Next was Ryan Ward with 69 points, and then Craig Point with 61 in his rookie season. 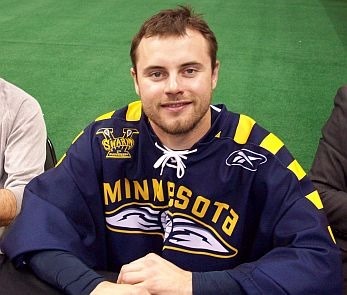 Point would only play four more games as a member of the Swarm before being traded to the Knighthawks with Dean Hill in exchange for Aaron Wilson early in the 2009 season. Fourth in scoring was Sean “Mr. Clutch” Pollock, with 60 points followed by Chad Culp with 55, his most productive season (tied with 2006). Travis Hill led the team in loose balls with 108 and penalty minutes with 86. He was also the main face-off guy, winning 81 of 208 (38.9%). In goal, Nick Patterson played the vast majority of the season (905 minutes) with a GAA of 11.99 and a 76.8% save percentage. Kevin Croswell did a pretty decent job as a backup, beating Patterson in both GAA (11.26) and save percentage (78.9%) in his 64 minutes. A number of players played their first season in 2008, starting with the Rookie of the Year, Craig Point. Other Swarm players making their NLL debut that year: Colin Achenbach, Kevin Croswell, Nick Inch, Justin Norbraten, and Chris Courtney. This was the final NLL season for two Swarm players: the aforementioned Chris Courtney (whose NLL career spanned just two games) and Mark Miyashita. Miyashita was the first overall draft pick in 2003 (ahead of Taylor Wray, Ryan Ward, Craig Conn, Scott Evans, and Scott Ranger), but his career was limited to 46 games over five seasons thanks to multiple injuries. The Swarm did well when the annual awards were announced: Ryan Cousins was named Defensive Player of the Year for the second straight year, Craig Point was named Rookie of the Year, Marty O’Neill was GM of the Year, also for the second straight season, and team President Tom Garrity was named Executive of the Year. The All-Star game was held in Edmonton in 2008, and both Ryan Cousins and goalie Nick Patterson were named starters. Andy Secore was named as a reserve, though he was injured and replaced by Shawn Williams (who scored the OT winner in the game). New York’s Casey Powell was also a reserve but injured, and Ryan Ward took his place. The Swarm were popular in Minnesota, a far cry from the Georgia Swarm of 2016-2017. Their home average was 11406, 6th in the 12-team NLL. That wasn’t even their best season attendance-wise: they pulled in 12308 per game the next season. They went from a minimum of 10104 in the home opener up to a maximum of 13004 in their win over the Shamrox on March 14. The attendance at their home playoff game was 11088, right around their season average. No idea who the halftime entertainment was. This entry was posted in Georgia Swarm, History, Minnesota Swarm. Bookmark the permalink.